The Ateneo Lady Eagles have finally booked a ticket for the Shakey's V-League Season 8 2nd Conference Final 4 after they beat the Philippine Navy yesterday via 4 sets. The Phenom, Alyssa Valdez, Dzi Gervacio and The Heat, Fille Cainglet stepped their game up just to beat the very determined Navy Team. The set scores were: 13-25, 25-20, 25-23 and 25-19. The Navy Team captured the first set but Ateneo came back strong to get the 2nd set, 3rd set and 4th set. 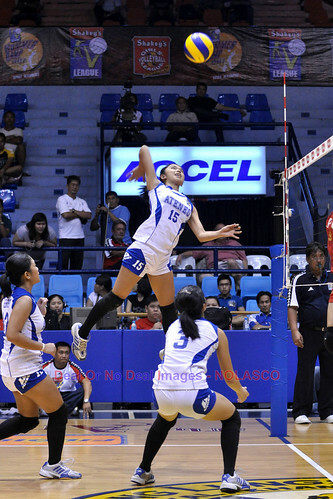 Fille and Alyssa were the 2 leading scorers for the Lady Eagles in this game. They combined for a total of 38 successful hits that puzzled the Navy Team. Dzi Gervacio on the other hand added 15 valuable hit points that was highlighted by her flawless jump serves to help the cause of the Lady Eagles. Dzi's invaluable performance earned her the best player of the game award. But nevertheless, their concerted efforts sealed this win for the Lady Eagles. This huge win of the Lady Eagles has enabled them to avenge their August 11 loss to the Navy Team and most importantly it also enabled them to get the 3rd Final 4 slot in the V-League. And also, with this big momentum booster win of the Lady Eagles, I'm sure they will be a tough nut to crack in the Final 4. They might face the Philippine Army if the placings will not change in the next few days. The Lady Eagles at number 3 will join the number 1 Philippine Army and the number 2 San Sebastian Lady Stags. The 4th slot will either be given to the Philippine Navy or to the Philippine Air Force.